A design driven by Humanscale’s passion for the environment, the Liberty Side chair was created to push the boundaries of minimalism found in the Liberty task chair and be as simple and environmentally friendly as possible, without sacrificing Humanscale's philosophy of complete, automatic comfort. Niels Diffrient developed the Liberty Side to showcase the same complete-body comfort found in Humanscale task chairs, but made with lightweight, recyclable and long-lasting materials. Using Humanscale's tri-panel backrest construction, the Liberty Side chair offers body-fitting comfort and lumbar support. This contemporary, multipurpose chair uses revolutionary Form-Sensing Mesh Technology and a pivoting backrest to provide complete support during a gentle recline. Designed to complement the Liberty task chair, the Liberty Side is a beautiful and versatile chair that encourages the same balanced movement throughout the day. Self Adjusting Recline The Liberty Side chair features an intelligent counter-balance recline mechanism that automatically provides the right amount of support through the full range of recline motion, regardless of user size and weight. Unlike many conference chairs, it is flexible and encourages the user to stay active, while keep them comfortable. Made predominantly from lightweight 100% recycled die-cast aluminum, the Liberty Side chair was created to be long-lasting and environmentally friendly. Overall, it is constructed from 85% recycled content and is 99% recyclable. The textiles for the chair’s seat were chosen especially to complement the high environmental standard. Its modular design means it can be customized and easily updated as needed. With a unique mesh back and seat, the Liberty Side chair is sturdy and supportive, ensuring complete comfort. The back tri-panel construction is breathable due to the mesh and offers customized support, while the backrest pivot offers additional comfort. The mesh seat has a frameless front edge that is supportive yet soft. 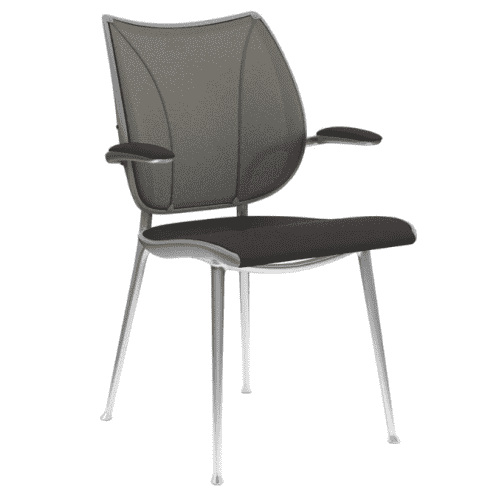 The perfect chair for conferences, meeting rooms and hospitality seating, the Liberty Side chair’s ergonomic support ensure the user can sit comfortably all day long. "I keep thinking, 'how much simpler can this be?' and come up with the end result." Created by legendary designer Niels Diffrient, the Liberty side chair complements the Liberty task chair and offers comfort, style and flexibility in a conference seat. Diffrient collaborated with textiles designer Elizabeth Whelan to make a mesh design with give, but that would still provide enough firmness for automatic lumbar support. Liberty’s mesh back is formed by combining three panels of this mesh in the same way a tailor combines multiple pieces of fabric to make a shirt. The result is a conference chair with custom-made contours to fit and support the human body in unprecedented comfort.